Boyfriend lovesss this in the winter! My boyfriend is really picky with his scents. Sandalwood is his winter fragrance pick. I bought this for him. He has sensitive, dry skin which and with a rough beard that combination leaves irritated skin, red bumps and ingrown hairs. Almost immediately, after his first use, it cleared up the problem! He loves it and says his razor glides over his face, making shaving almost enjoyable (at least, not a task).Not only does he like the product, but I love it! The sandalwood is a wonderful winter smell. He prefers the Lemon in the summer! Never a nick or scrape when you use the oil pre-shave. Best shave item i've ever tried. While I've tried many purist and non purist techniques to shaving the pre-shave oil is one I like in theory but in practice is a bit annoying.The oil works great, smells great and delivers a smooth, non irritation shave. The only downside is actually applying it. 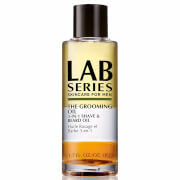 As it's an oil it doesn't wash easily under the tap and inevitably gets on the handle of the razor and shaving brush. Pain to wipe off.Still a very nice product. Even the Art of Shaving cream without the pre-shave oil will deliver an incredible shave - far superior then any gels and standard forms you find in the supermarket.